Information shamelessly lifted from meteorwatch.org and metcheck.com. So… Friday night it is then, caveats about weather forecasting notwithstanding. If we can drag ourselves out of the bar for 5 minutes. I made this ages and ages ago. I feel compelled to share this wisdom with others. Ivory trading is illegal. Here’s a nice story about how the ill-gotten wares of the Ivory traders can have a use in science. 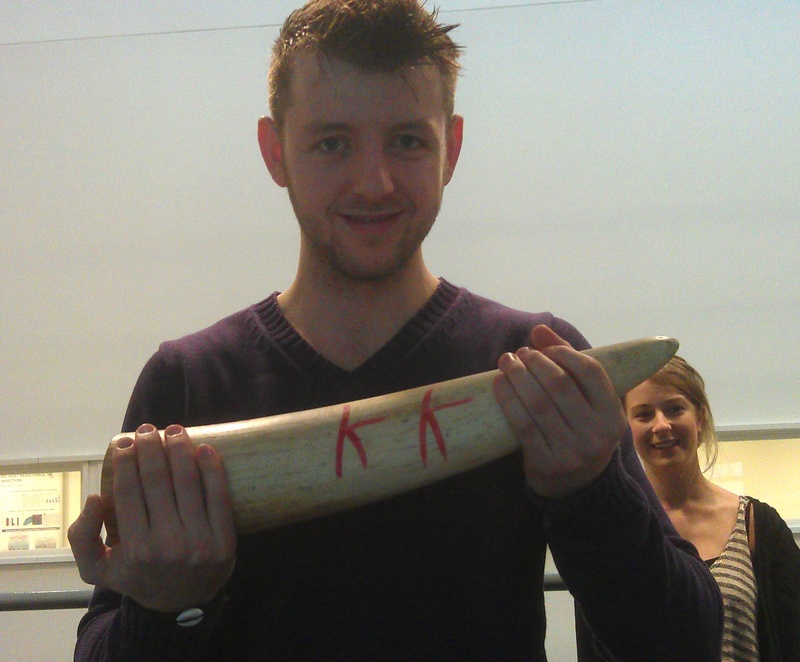 Our research technician Liam with some confiscated elephant horn, now destined for medical research. Ivory trading and the hunting and killing of elephants for their tusks is illegal in most countries. Despite this there is considerable demand for ivory, ivory trinkets and other elephant derived products used in unproven and largely worthless traditional medicines . The trafficking of Ivory is tightly restricted under international law, and it is illegal to bring any Ivory into the UK without the correct permits , and the UK border agency will confiscate any Ivory that people attempt to bring into the UK. So, what happens to the Ivory that is confiscated? It would be immoral for the UKBA to sell it and sadly it cannot be re-united with its owner. One potential use for Ivory is biomedical research. Ivory is primarily made up of a substance called Dentine, found in teeth. Dentine is also an acceptable substitute for human bone in the sorts of assays that our lab does to test the effect of various substances on cells called Osteoclasts that are responsible for bone resorption (basically bone destruction). During growth and development of the skeleton, bone is formed (by Osteoblasts) and broken down (by Osteoclasts) – it is thought that the bone disease Osteoporosis is caused by an imbalance of bone formation and destruction – i.e. too much Osteoclast activity. If we can find a therapeutic agent that inhibits Osteoclast activity, we might be able to halt or slow the progression of Osteoporosis. The upshot of all this is that our lab has obtained a section of Elephant horn that has been confiscated by the UKBA. We will recycle this and use the dentine in our bone resorption assays. Ivory belongs on Elephants. However, if someone has already killed the elephant and removed the Ivory, better that we use it to further medical research and perhaps save or improve some lives, than turn it into a bauble that sits on a shelf gathering dust. I really should try and blog more often. Now with added reality! Warning: Contains Snark. I got my ‘red pen’ out. Basically – we have 10 sections. Homeopathy is old – therefore it works! Homeopathic hospitals – bizarrely, this shows that there once were quite a few US and UK homeopathy hospitals – now there are less – I wonder why? A bit of whinging about previous complaints about homeopathy. Some arm wavy stuff about homeopaths. FACT 1: Hippocrates ‘The Father of Medicine’ of Ancient Greece said there were two Laws of Healing: The Law of Opposites and the Law of Similars. Homeopathy utilises the Law of Similars, orthodox medicine uses the Law of Opposites, e.g. antibiotics, anti-inflammatories, anti-convulsants, anti-hypertensives, anti-depressants, anti-psychotics. FACT 2: Discovered by German doctor Samuel Hahnemann over 200 years ago homeopathic medicine is based upon sound scientific principles of the Laws of Nature – unlike medical theories which are constantly changing. Far from being ideas-based, Homeopathy is a completely evidence-based, empirical medicine – a unique concept when it was founded. Rather than being based upon ‘sound scientific principles and the Laws of Nature’, homeopathy conveniently ignores certain Laws of Nature (avogadros constant, 2nd law of thermodynamics) as they are inconveinient. Medical theories change to reflect current evidence and best practice. Homeopathy, like any other faith-based system, selects what it believes in order to support preconceived notions. FACT 3: In Hahnemann’s first experiment, though perfectly healthy at the time, he found that by giving himself repeated doses of cinchona bark (quinine), he brought on all the symptoms of a malaria attack – fever with heat and chills. Or maybe he gave himself quinine poisoning? FACT 4: Hahnemann was the first to conduct trials on medicines. He set about discovering the healing properties of plants, metals and minerals by testing them on himself and on healthy volunteers or ‘Provers’, recording all the symptoms that each substance caused. He created a ‘Provers Union’. FACT 5: After some years of practising, Hahnemann found the tiny doses of substances he was using caused side effects. He experimented by diluting then succussing a substance (shaking through striking the phial a number of times between numerical potencies). The potentised remedy was safer to use on the sick, unwanted side effects disappeared and medicines were more effective. FACT 6: Hahnemann tested 99 substances on himself and healthy volunteer Provers, keeping detailed accounts of his observations. He matching the tested substances to heal symptoms of his patients using the Law of Similars. FACT 7: Every patient is unique so homeopathic medicines are individualised. The homeopathic practitioner treats the WHOLE PERSON, believing all symptoms are interrelated and seeks to select a medicine which fits the whole state. FACT 8: Homeopathic medicines are chosen on the basis of a patient’s mental, emotional and physical constitutional type, unlike orthodox medicines which treats in a ‘one-size-fits-all’ manner. A homeopathic medicine is chosen on the basis of totality of symptoms. FACT 9: Just as there are fat and thin, dark and blonde, tall and thin, chilly and hot, talkative or quiet people, lazy or hurried people, etc., etc., there are homeopathic medicines to match all types. FACT 10: Homeopathic medicine awakens and stimulates the powers of the whole body by communicating a current/pattern/frequency of energy, which acts as a catalyst to set healing into motion and jump start the body’s own inherent curative mechanisms. This is utter nonsense. There is no evidence of any of this army wavey “current/pattern/frequency of energy” guff. FACT 11: Homeopathy assists the body to heal itself, to overcome an illness which brings the patient to a HIGHER level of health. Orthodox medicine suppresses the illness, bringing the patient to a lower level of health. Evidence or GTFO (there – I said it – just let me have one). Another unsupported and wildly speculative claim with little basis in reality. FACT 12: Outcomes of homeopathic treatment are measured by the LONG TERM curative effects and the complete eradication of the disease state. FACT 13: Homeopathic medicines are used for inherited diseases and trace their origins to three main genetic causes or ‘miasms’: Psora, Syphilis and Sycosis. We’ll just ignore the whole of molecular biology and genetics, because otherwise things might get difficult. FACT 14: Most remedies are made from a single substance but some are made of compounds, while others are mixtures of compounds. Hepar sulph and Causticum as examples of compounds. FACT 15: During the making of a homeopathy remedy, the formative intelligence of the substance is imprinted on the alcohol/water medium via the process of succussion (vigorous shaking) between each numerical potency. Remedies are not made using dilution alone. “Formative intelligence of the substance is imprinted on alchol/water medium” – LOLWUT? Once again, and unsupported assertion with no basis in reality. Remedies are made using the process of trituration, whereby the substance is reduced first to smaller than molecular size, (nano-phase) which causes electrons to be rubbed off, with a negatively charged electrromagnetic energy, measurable by piezo-electric constant. This energy is passed on to the dilute, which becomes charged. Succussion is the amplification of that energy. Wait – shaking causes electrons to be rubbed off, with a negatively charged electromagnetic energy??? Is that why the batteries in my TV remote control are good for a few more days if I take them out and shake them? FACT 16: Homeopathic medicines are made using the original substance, plus 40% alcohol as a preservative and 60% distilled water or 50/50 of each. Or 87% Alcohol, 13% Water – but why does that matter? FACT 17: There are no molecules in any homoeopathic dilution, because the substances have been reduced to nano-phase, which is smaller than a molecule. FACT 18: There are more than 4,000 homeopathic medicines. There are over 9,000 types of beer. Cheezus – even homeopaths can’t tell the difference between ‘homeopathic’ and ‘herbal’. FACT 20: Homeopathy works very FAST in acute illnesses, more gradually in chronic illness. FACT 21: Many high fevers can be lowered within minutes after taking the homeopathic medicine Belladonna and Aconite. FACT 22: Homeopathic remedies are inexpensive to produce and buy. Sugar is quite cheap on the open market, although Homeopathy is the most expensive kind of sugar one can buy. FACT 23: Homeopathic medicines can also be made using a Radionics machine. Radonics machines? They don’t work. FACT 24: Homeopathic medicines have no toxic side-effects. FACT 25: Homeopathic medicines are NON-ADDICTIVE. FACT 26: Homeopathic medicines work well for small babies, animals and plants, showing this cannot be placebo effect. Nonsense – babies and animals can feel the effects of the placebo effect, and babies, animals and plants can be subject to the secondary placebo effect, where the owner/parent’s reaction or interpretation of the state of the baby/animal/plant is subject to their assumptions about the treatment. 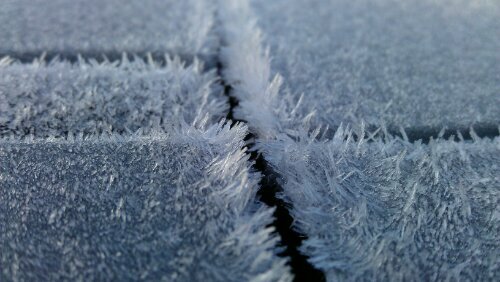 For more about the oft repeated fallacy – see point 3 in this post. FACT 27: Homeopathy is safe for women to take during pregnancy and safe for old people. FACT 28: There are thousands of text books on homeopathic medicine, available at specialist outlets, which record historical evidence of homeopathic cures for a vast number of conditions. Books full of anecdotal evidence, which is essentially meaningless. It was used extensively in the 19th century because medical science back back then was not up to much, and sugar pills were as likely to be successful as leeches and trepanning. Medical science has moved on since then. Homeopathy has not. An uncontrolled and extremely dodgy piece of work which is explored in more detail here. No it has not. See response to fact 26. Homeopathy studies on farm animals are as dodgy (as far as I have seen) as those conducted on humans. FACT 32: Homeopathy is used to treat the cows at Yeo Valley Organic Farms. Wait! Farmers weekly! Why didn’t you say so! Quickly! Tear up the textbooks, an agricultural glossy has decreed that homeopathy works. There is also a British Veterinary Voodoo society. Go figure. FACT 35: Homeopathic medicines are used in agriculture, known as Agrohomeopathy. And this has been shown to work where? FACT 36: Wine is produced from grapes using 100% homeopathic agriculture. Wow – a sales gimmick. Yawn. FACT 37: There were once fourteen Homeopathic Hospitals in Britain. FACT 39: In 1854 there was a cholera epidemic in London. When the House of Commons asked to see a report about the methods of treatment, patients who had received homeopathic treatment at the Royal London Homeopathic Hospital were not included. The House of Lords demanded an explanation and it was shown that under conventional medical care the death rate was 59.2 per cent but for patients under homeopathic care, only 9 per cent. FACT 40: There were homeopathic hospitals in France, with Neuilly treating soldiers in WW1. WW1 – that was the one where nobody died, right? FACT 41: Homeopathy in Russia dates back to 1824. FACT 42: At one of the earliest debates on the NHS Act of 1948 the Government pledged that homoeopathy would continue to be available on the NHS, as long as there were “patients wishing to receive it and doctors willing to provide it”. FACT 43: There are now only four homeopathic hospitals in the Britain – in London, Bristol, Liverpool and Glasgow. The total cost to the NHS in 2010 was around £4 million a year compared to over £100 billion for the total annual NHS budget! FACT 44: The cost of homeopathic medicine to the NHS in 2010 was £57,000 per annum compared to £11 billion for pharmaceutical medicine. Speaks volumes as to the intelligence of 208 of our elected representatives. An uncontrolled observational study in which patients were allowed to keep taking other medicines at the same time. FACT 47: In a survey of 500 patients at the Royal London Homeopathic Hospital, 72% of reported being able to stop or reduce their conventional medication. On average, 70% of follow-up patients seen at the homeopathic hospitals report a positive outcome from homeopathic treatment. Once again – uncontrolled so how do we know the outcome was down to the sugar pills. Ah yes. Prince Charles. Known for his scientific knowledge and rigour. FACT 51: Homeopathic Hospitals are clean, friendly, with well informed staff and patients are generally pleased with their treatment. The chances of contracting MRSA or C. Difficile at a Homeopathic Hospital are extremely rare. Contracting MSRA or C.diff is much less likely in institutions where invasive surgical procedures aren’t actually carried out. FACT 52: After its formation in 1847, members of the American Medical Association had great animosity towards homeopathy and decided to purge all local medical societies of physicians who were homeopaths. FACT 54: In 1858 the British Medical Association also passed internal rules that forbade their members from practising homeopathy or even consulting with a homeopath. FACT 55: In 1910, vigorous attempts to stamp out homeopathy were stepped up in the USA when the Carnegie Foundation commissioned a report by Abraham Flexner, who was chosen to reform American medical education. The report was an evaluation of US medical schools and it gave the homeopathic and herbal colleges a bad rating. In 1900 there had been 22 homeopathic colleges but only two were left in 1923. FACT 56: In 2005 the World Health Organisation brought out a draft report which showed homeopathy was beneficial causing Big Pharma to panic and the Lancet to bring out an editorial entitled ‘The End of Homeopathy’. Just because you don’t understand a paper or press release, doesn’t mean it was done maliciously. FACT 59: There are a few hundred Skeptics who spend their time attacking homeopathy on their blogs and websites, especially in the UK. FACT 60: In February 2010, the House of Commons Science & Technology Committee called for an end to funding for homeopathy on the NHS after conducting an Evidence Check in November 2009. FACT 61: Only half of the 14 Members of the Science and Technology Committee actually attended the two oral hearings and those MPs who attended appeared to have little knowledge or understanding of it. Of the nine witnesses at the first hearing, only two who had any relevant qualifications – Dr. Peter Fisher, the Queen’s physician and Clinical Director of the Royal London Homeopathic Hospital and Dr. Robert Mathie, Research Development Adviser of the British Homeopathic Association. There was noone called to represent patients. “any relevant qualifications” what you mean like doctors and pharmacologists/pharmacists? FACT 65: In July 2010 the UK Government came out in favour of continuing the NHS Funding for homeopathy. Or maybe they just failed to legislate either way, despite advice from the chief scientific advisor. This is incredibly disingenuous. And wrong. 76% of current practice is evidence based – Imrie R. The evidence for evidence-based medicine. Complementary Therapies in Medicine. 2000. Volume 8, Issue 2, Pages 123-126. That link does not back up your claim. And even if it did, hundreds of thousands of doctors haven’t, therefore…. FACT 68: Unlike orthodox medicine, where the bill for claims for side-effects of pharmaceutical medicines runs into millions, a leading UK insurance company reported only ‘a couple’ of insurance claims against homeopaths in a ten year period! Hence insurance cover for homeopathy is around £70 per year, reflecting low risk. That’s because sugar pills have relatively few side effects. FACT 69: In 200 years, there has never been a single homeopathic medicine recalled, unlike many pharmaceutical medicines. Because 1) sugar pills don’t have side effects, and 2) homeopathy is almost entirely self-regulated. People don’t like to wail on themselves. FACT 70: The pharmaceutical industry does not want the Public to discover that homeopathy works! People don’t want other people to find out how something that doesn’t work, works?? Which was subsequently debunked here – J. Maddox; J. Randi, W. W. Stewart (28 July 1988). “”High-dilution” experiments a delusion” (PDF). Nature 334 (6180): 287–290. FACT 72: The first clinical RCT trials of medicine where undertaken by Dr. Samuel Hahnemann and used in Provings of medicines. 50 – 100 volunteer Provers took the 30c potency of a medicine every two hours until they started experiencing symptoms which were carefully recorded. The group supervisors collected all the data and delivered it to the Proving Master, who was the only person who knew the name of the medicine under trial. That way, all bias was removed. FACT 73: In the past 24 years there have been many clinical trials that prove homeopathy works. there have been more than 180 controlled, and 118 randomized, trials into homeopathy, which were analysed by four separate meta-analyses. In each case, the researchers concluded that the benefits of homeopathy went far beyond that which could be explained purely by the placebo effect. The vast majority of homeopathy trials are flawed. I know – I read over 100 of them – please see here. Rampant speculation, ‘preliminary data’ – hardly compelling. They can’t be much cop if the UK Veterinary medicines directorate are clamping down on ineffective homeopathic remedies. FACT 80: Homeopathy can never be properly tested through double blind randomised trials because each prescription is individualised. Therefore 10 people with arthritis may all need a different homeopathic medicine. 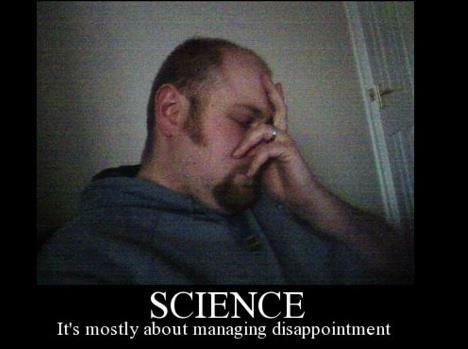 You spend 10 facts trying to demonstrate a science base for homeopathy, and then try and claim that science can’t be used to test homeopathy. LAUGHABLE. FACT 81: The homeopathic physician endeavours to search for and remove the cause of the disease in order to heal the EFFECT of it. They may endeavour all they want – but sugar pills are ineffective. FACT 82: Homeopathic Practitioners train for three to four years. They study anatomy and physiology, as well as pathology and disease, Materia Medica, Homeopathic Philosophy and the Homeopathic Repertory. We know what gets taught on a homeopathy course. FACT 83: Most homeopaths treat patients who have been referred to them by word of mouth. Most patients seek out homeopathy because conventional treatment has not benefitted them or because it poses too great a risk of side-effects. FACT 84: The homeopathic community has thousands, even millions, of written case notes that demonstrate the positive benefits of their treatment. Some homeopaths have video proof of their patients before and after treatment. Uncontrolled case notes – largely meaningless. FACT 85: Homeopaths charge patients an average of £50 an hour, whereas specialist Doctors can charge up to £200 or more. Not on the NHS. And anyway – £50 for meaningless banter and sugar pills? FACT 86: According to the WHO, homeopathy is the 2nd most popular and widely used medicine in the world. FACT 87: The popularity of homeopathy has grown in the past 30 years, its revival entirely through word of mouth and estimated to be growing at more than 20% a year the world over! FACT 89: Many of the famous swore by it including writers Charles Dickens, William Thackeray, George Bernard Shaw; artists such as Renoir, van Gogh, Monet and Gaugin and the composers Beethoven, Chopin and Schumann, to name a few. FACT 90: Nowadays many modern celebrities opt to use homeopathic preparations. FACT 92: The Royal Families of Europe use homeopathic medicine and Queen Elizabeth II of England is reputed to never travel anywhere without her homeopathic medicines. FACT 93: Homeopathy is practised nowadays in countries all over the world. FACT 94: In India there are 100 homeopathic medical schools, around 400,000 registered homeopathic doctors with approximately 13,000 being added every year! There were 28 homoeopathic dispensaries in Delhi in 1978 and now 78. The number of patients taking homeopathic medicines has increased from around 800,000 patients in 1997 to 13,62,174 patients in 2006. FACT 95: 100 million Europeans use homeopathy – 29% of the EU population. 65% of Europeans have declared they have used homoeopathic medicine and 45% have declared that they are satisfied to use it again. FACT 97: In Germany 20% of doctors treat patients with homeopathy. FACT 98: In the Netherlands 47% of doctors treat patients with homeopathy. FACT 100: The media as a whole has been unwilling to air a proper defence of the efficacy of homeopathy and the validity of this 200 year old profession. Unwilling? Or unable? Taking advantage of sick people to peddle nonsensical, unsubstantiated cures is indefensible.